Burt Reynold’s ‘Bandit’ Pontiac Firebird Trans Am Sells For $192,500 at Barrett-Jackson auction in Las Vegas. Looks like Burt still has his mojo. 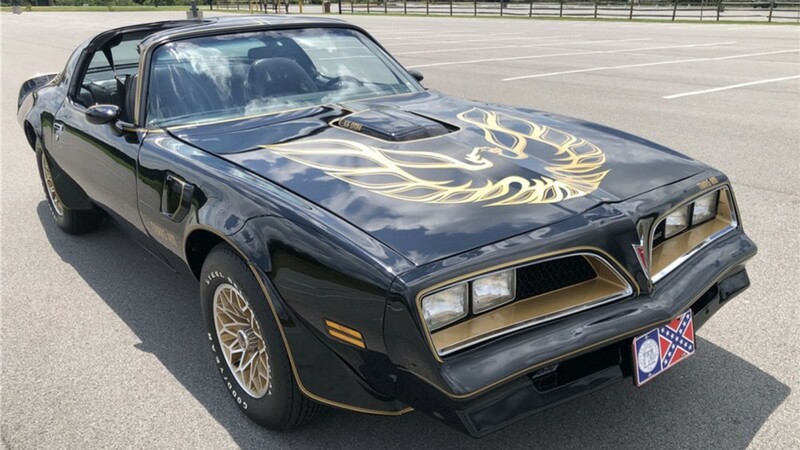 A 1978 Pontiac Firebird Trans Am owned by movie star Burt Reynolds that was customized to look like the one he drove in “Smokey and The Bandit” was sold at the Barrett-Jackson Las Vegas auction on Saturday night for $192,500. It was a high price for a tribute car that wasn’t even the same model year as the black and gold Trans Am in the movie, but having been commissioned and owned by Reynolds himself it came with a unique mystique, not to mention his signature on the glove compartment door. Similar tribute models of the late actor’s Firebird Formula from “Hooper” was also sold for $88,000, as was a 1987 Chevrolet R30 pickup modified to look like the GMC Indy Hauler pickup from 1981’s “Cannonball Run” that went for $49,500. If you’re wondering what happened to the real “Bandit” cars used in the movie, well, there were about 12 for the filming and Reynolds said they were all sent to the junkyard because they got so beat up from all of the stunts. There is one car, however, that didn’t appear in the movie but that Universal Pictures took on tour to promote the film, which was last sold in 2016 for $550,000. It was bought by famed Car Collector John Staluppi and sits in his Cars of Dreams Museum.